Which Face is Who and Who Names their Child Pollux...? 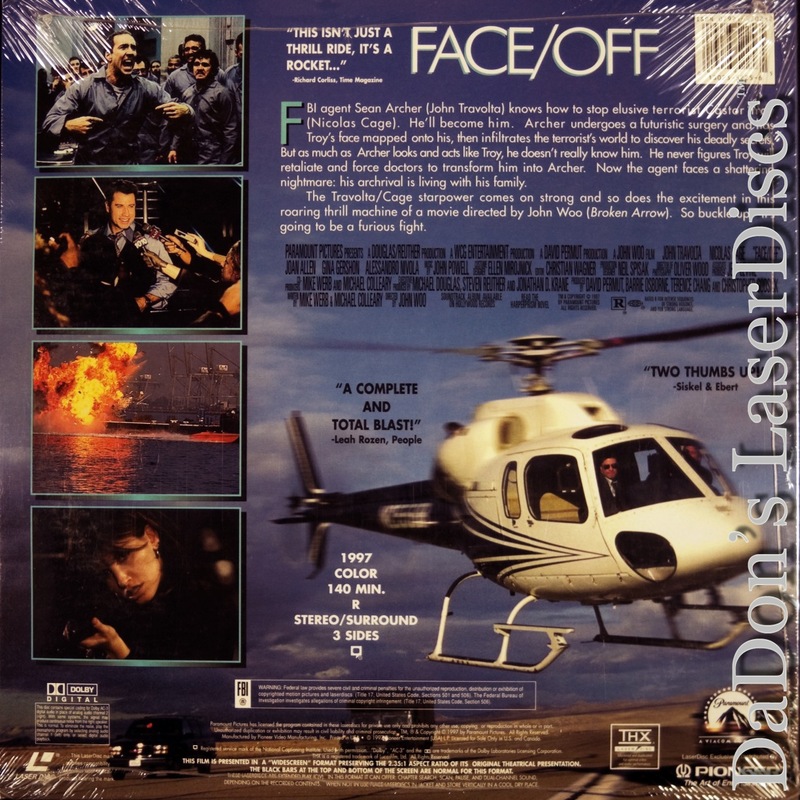 Face / Off 1997 - 140 min. 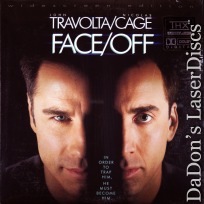 - Color Genre: Thriller Rated R Country: USA LaserDisc Movie Storyline: The ordeal of superheroic, singularly dedicated FBI agent Sean Archer (John Travolta) is only beginning after finally capturing his archnemesis, Castor Troy (Nicholas Cage), an elusive, maniacal terrorist who claimed the life of Archer's son. While Troy languishes in a coma, Archer surgically "borrows" Troy's face in an attempt to gather evidence about Troy's last bomb--which is currently ticking away in a Los Angeles office building. Trouble ensues when Troy wakes up faceless, borrows Archer's visage, and makes a mess of Archer's life; all the while, both men struggle to adapt to their new identities while struggling to blow each other away. Another balletically filmed, thematically complex action-smorgasbord from Hong Kong-vet John Woo. Academy Award Nomination: Best Sound Effects Editing. 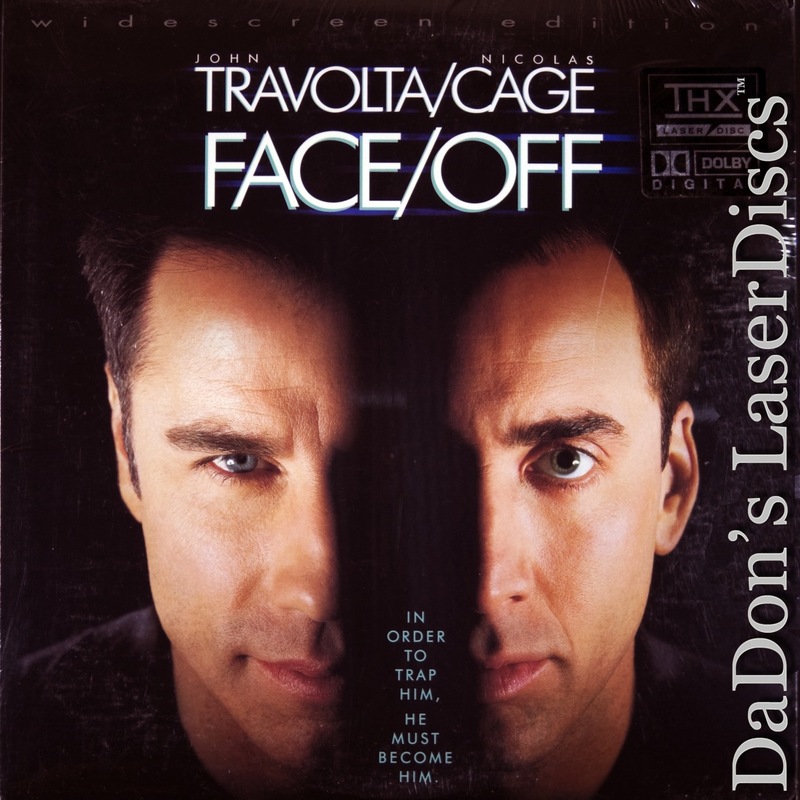 LaserDisc Movie Review: The third of John Woo's American-made feature films, Face/Off stars John Travolta as Sean Archer, an FBI agent obsessed with capturing Castor Troy (Nicolas Cage), a criminal genius who years before killed Archer's son while trying to assassinate the agent. Archer's single-minded pursuit of Troy has caused serious harm to his marriage, but Archer thinks the light may have appeared at the end of the tunnel when a seriously wounded Troy is captured in a bloody shootout. However, it turns out that Troy has planted a time bomb, with a biological payload that could destroy the entire city of Los Angeles --- and Troy isn't about to say where it is. The only other person who knows the bomb's location is Troy's brother, Pollux (Alessandro Nivola), who is no more helpful than Castor. FBI scientists hatch a plan: they have developed an experimental surgery which would allow them to graft Troy's face temporarily on Archer's head and allow him to question Pollux as if he were his brother. But after Archer has taken Troy's face, Troy regains consciousness and forces the doctors to give him Archer's face. Now the criminal mastermind has the FBI at his disposal, and the lawman is underground with few places to turn. Along with Woo's usual elaborately choreographed action scenes, Face/Off features a number of notable supporting performances, including Joan Allen as Archer's wife, Colm Feore and C.C.H. Pounder as FBI scientists, and Gina Gershon as Troy's loyal but long-suffering girlfriend. --- Mark Deming The third time was the charm for John Woo in Hollywood, as his 1997 blockbuster Face/Off reached the passionate intensity of his best Hong Kong works. Anchored by dexterous performances by John Travolta and Nicolas Cage as the face-switching antagonists Sean Archer and Castor Troy, the preposterous story line becomes apt material for Woo to once again examine the intimate bond between cop and villain. Whether literally attempting to blow away the man in the mirror or insinuating themselves into the other's personal life, Travolta and Cage inhabit each other's persona with an adept mix of pathos and glee, rendering the transformation as plausible as it is fun. Woo's virtuoso action sequences, culminating in a dove-ridden church shoot-out reminiscent of The Killer (1989), are replete with his signature balletic slow-motion, razor-sharp editing, and two-fisted gunplay, reaching the emotional pitch of high melodrama with well-choreographed visuals akin to a lethal musical. Hailed for its action pyrotechnics and its strong, high-class cast, Face/Off became a summer hit and Woo's first unqualified American success. --- Lucia Bozzola Thanks for Visiting DaDon's Rare LaserDiscs ! Reviews, Articles, Newsletter and Information for Movies on LaserDisc LD Laser Disc, LazerDisc.